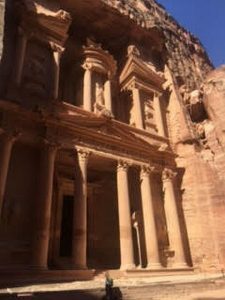 Welcome to Jordan, a fascinating gem in the Middle East that beckons with profound experiences from exploring the rose-colored city of Petra to floating in the Dead Sea to flying through the Wadi Rum desert in an open air, 4 x 4 vehicle. From bustling cities to the quiet of Bedouin desert camp to luxury resorts, Jordan will simply surprise you with breathtaking moments and feelings of wonder. Historic ruins, welcoming hospitality and unsurpassed luxury make Jordan an extraordinary destination. This UNESCO World Heritage Site and one of the new “Seven Wonders of the World” was once a bustling site in the crossroads of trade, built by the ancient Nabataeans. 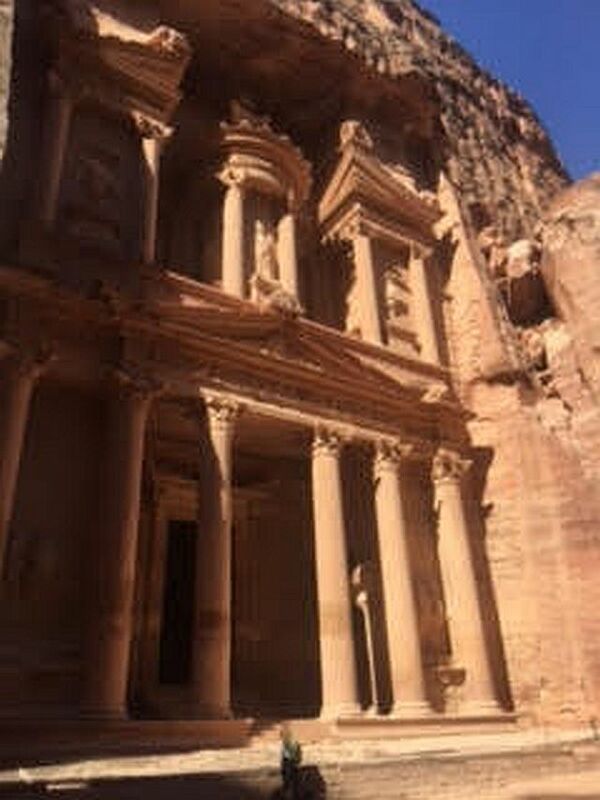 For thousands of years, Petra remained an ancient city, unknown to the modern world. Discovered by Swiss explorer Johann Ludwig Burckhardt in 1812, visitors have come from around the globe to explore its intriguing architecture. Continue on your walk and palaces, tombs and waterway systems come into view, one more exquisite than the next. Along the way, there are artisans selling spices, jewelry and meticulously- crafted sand art bottles. The truly ambitious can climb up (or take a donkey) the 800 steps to the magnificent Monastery. Don’t miss Petra at Night where the site takes on a mysterious glow by candlelight. For thousands of years, the wandering Bedouins have maintained their nomadic existence, living off the land in simple tents. Visitors can share this experience by sleeping in one of their camps like the Rahayeb Desert Camp in the Wadi Desert. Choose from tents or cabins, enjoy a traditional zarb (barbecue) dinner cooked in the ground and listen to their traditional music as you drift off to sleep under the stars. At other Bedouin camps, you’ll hear the tapping of the kettle, offering anyone near a cup of coffee or tea. You’ll find the people most welcoming. DH Lawrence called it “vast, echoing and God like” and the setting where David Lean filmed his award-winning film, “Lawrence of Arabia.” This is the infamous Wadi Rum desert, best seen from the perspective of a open-air, 4×4 jeep. Get an up close view of the massive “Seven Pillars of Wisdom” Lawrence wrote about in 1917. Luxury starts at the Kempinski Hotel Ishtar Dead Sea with its elegant, pure white surroundings, looking out on the Dead Sea between Jordan and Israel. Dine in one of their four exquisite restaurants and enjoy the magnificent sunsets from your terrace. There is something quite remarkable about floating in the Dead Sea. That’s because of the water’s high salt content and the Dead Sea is the lowest point in the world. Just sit in the water and you’ll pop up on your back without any effort at all. And don’t forget to slather the nutrient-rich mud all over your body, then bake in the sun and wash it off. Your skin will feel smooth and silky. One of the most revered holy sites in Jordan, Mount Nebo is where Moses is buried as well as where he stood and overlooked the Holy Land. You can see the same breathtaking views across the Jordan Valley and Dead Sea to the holy cities of Jerusalem and Bethlehem. 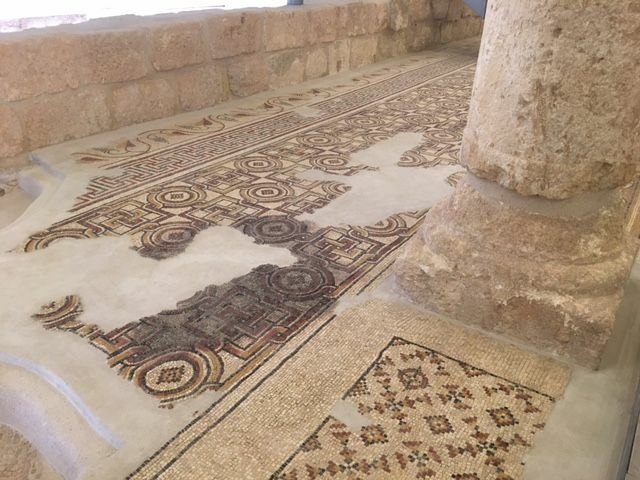 The hilltop church right next to it features beautiful mosaic floors. Wherever you travel throughout the country, it’s the warm, friendly people and hospitality that make Jordan such a unique and welcoming destination. For more information about Jordan, myjordanjourney.com. I gratefully acknowledge being hosted on this amazing journey by the Jordanian Tourist Board of North America. Fly to Amman, Jordan via Royal Jordanian Airlines that offers non-stop from many North American and Canadian cities. Also check out these places: Grand Hyatt Amman Rahayeb Desert Camp Marriott Petra Hotel and Kempinski Hotel Ishtar Dead Sea.